Go away go away go away go away go away go away go away. Fine, I’ll say something about it. Sounds like a song Bob Seger would have written on strong cold medication. First time I can remember not even slightly enjoying a chorus with handclaps. 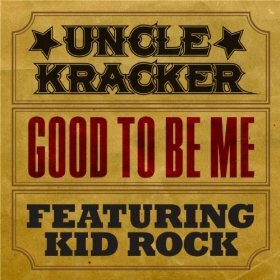 Kracker’s lame performance isn’t even enjoyable in that creepy, stoner-lite “Follow Me” way. The whole thing sounds laxadasically recorded. It features Kid Rock. And Mediabase shows it climbing steadily. We livin’ in a farce, country fans. …And what does it say about me that I even bothered writing this review? I need to reflect. Country Music has become the go-to genre for failed acts from all walks of music….. What’s funny is 10 years ago it was uncool to be country (unless you were Shania Twain) or even a country fan. I can’t justify the ‘D,’ I’d have given it an ‘F.’ Then again, I hate most of what goes to country radio nowadays. It was decently cool to be a country fan in the boom years of the nineties, I think. I think it’s less cool now. Then again, I’m possibly projecting my own feelings about mainstream country music onto it though. And I couldn’t agree with this review more. …i don’t wanna know how it feels, if it doesn’t feel good to be him. This is not what I’m ready for after being so badly overexposed to “Smile” – a song that sounded like it was written by a first grader. Leeann- I agree, I was referring to the period when females all but vanished from radio, and only pop-sounding females (rather than females who stayed true to themselves) managed to get crossover success. I should say females who embraced the poppier side of country [and remixes] compared to those who just let radio play their songs as is. Country artists need to stop having crossover duets. It’s like they think it’s a free pass to dabble in country whenever they feel like it. I blame this song on Kenny Chesney. “Smile” absolutely was a bad song. This one is not. I mean it’s not terrible in that it is offensively bad. I think a “D,” is about the right grade but I wouldn’t have quibbled with a “C” if someone wanted to go there. At best it’s average- but that has become what permeates music right now. It’s not just a country problem. Much of the musical world is just trying to create catchy tunes that drive digital sales. Plus I think the timing of the release of this song hurts. It hit pop/rock radio in May of last year and landed somewhere on the charts for a little while. But it worked there because it stood as a laid back summer anthem that you could listen to while on vacation with a beer in your hand. Right now, it just feels odd. I’m not against releasing it to country radio but I’m against it being released to country radio almost 8 months after it was released to the other genres. Country music is the one genre that is still doing well sales wise and the programmers treat it like sloppy seconds. Stupid. Well, personally I could never stand Kid Rock to begin with, so it’s no big loss. And he doesn’t really know a flying fig about real country music to begin with anyway (IMHO). Erik: I think Kid Rock has more of an appreciation for country music than a majority of the people on country radio right now. You know I read this review, and I started thinking about what Natalie Maines said about not wanting to be lumped in with Reba McEntire or something to that effect. Yeah she shot her career straight down the drain with that and the whole “comment” in 2003, but I wonder if she saw what Country Music was becoming way before everyone else did because if I was an old school (Even up to the early 00’s), I wouldn’t want to be played next to these phoney “country” acts either (And Reba herself has kind of fallen victim to the “We don’t want things to be too country so make it pop” spell”). I like some of what Country Music has to offer these days (Jamey Johnson, Zac Brown, The Band Perry), but I really don’t like all these “Pop” artists coming to sing Country songs which aren’t country. It almost seems like Country music is becoming the last best hope for those who had failed careers, or careers that got shot straight to hell. Case in point, Uncle Kracker. They started playing that Follow Me song on the radio and I switch the station. Not that I don’t like the song (it’s alright, kind of forgettable), but it’s the whole “Why the hell is this song on a country music station.” Same thing with Darius Rucker, who does have a country sounding voice, but is utilizing it on bad songs and single choices. Also, and I don’t know if you guys will ever get around to reviewing it, but Aaron Lewis (lead singer of the rock band Staind, The group that did Outside) has a country song out now that doesn’t even remotely sound country. I’m getting My radio listening has gone way down because of this but it’s a trend that is probably going to continue this year. So yeah, Natalie was probably right. Everyone got pissed at her, but like the comment, it seemed like she saw things years before everyone else. I hope country radio continues to not play the Dixie Chicks, as they are “country” and what the radio is passing off now isn’t. “Follow Me” is being played on country radio now? Please, no! Sadly the best thing to do with country radio is to not actually listen to it all the time. With Sirius I just listen to the old country channels and then just catch up on the new stuff through downloading. It makes it a lot less frustrating. I respect Kid Rock, though he’s easy to dismiss like I did (mostly jokingly) in the review. I have no idea how “authentic” his body of work really is, since it seems as though he’s rewritten his style allegiances and even his own personal history quite a bit over the course of his career. But I can tell he has raw knowledge of country music, even if he doesn’t employ it in his bids at country radio (aside from “Picture”). Check out his Crossroads with Hank Jr. if you get a chance.